Recent moves by the Thai government to send back refugees from Burma have spurred fears among the 140,000 estimated refugees living in camps along the Thai-Burma border. Thailand’s National Security Council secretary, General Tawin Pleansri, told local media recently that the government was considering a plan to repatriate the refugees. Tak provincial Governor Samart Loifah further fuelled refugee fears when he was reported as saying in April that “it is time to consider starting a program to get people to return to Myanmar [Burma] voluntarily”. Tak province is home to three of nine refugee camps that house Burmese refugees, including the largest, Mae La, which has 45,000 residents. Samart Loifah said that any long-term solution to the refugee problem was not likely. “The province and the Ministry of Interior have no policy to give them refugee status.” And the governor further urged international donors to reduce spending on the camps to encourage people to leave. The Thai Burma Border Consortium, an umbrella group of non-governmental organizations that provide support to the refugee camps, noted in a report last year that residents of eastern Burma have suffered protracted displacement and chronic poverty”. The report also stated that 3,500 villages have been destroyed or forcibly relocated since 1996, including 120 communities between August 2008 and July 2009. Burmese army offensives in Karen state have forced tens of thousands of villagers to flee their homes and seek shelter along the border with Thailand. The TBBC report estimates that “at least 73,000 people were forced to leave their homes in eastern Burma in the last year, and over 446,000 people remain internally displaced”. Since mid-February this year, community-based groups along the border estimate that as many as 15,000 villagers have taken refuge in makeshift camps because of fighting between the Burmese army and their former allies, the Democratic Karen Buddhist Army. 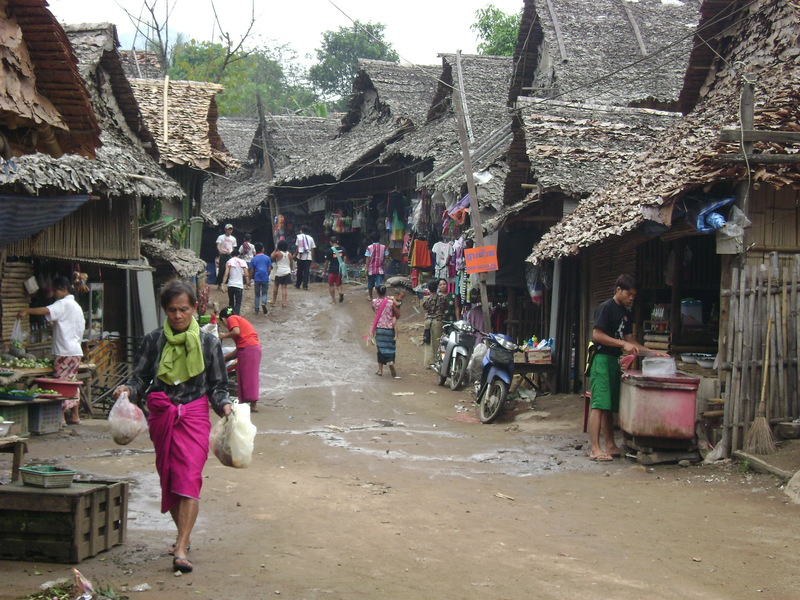 Tak province has three camps that house refugees from eastern Burma: Mae La, Umphiem Mai and Nu Po. About 80,000 refugees live in these camps, according to the TBBC, but more than 25,000 of them have not registered with Thai authorities. Naw Tauh Tauh, 55, from Mae La camp, said she is concerned that the situation in Burma is not safe enough for people to return. She has lived in refugee camps for the last 26 years, predating the establishment of Mae La. She previously lived in Baw Naw refugee camp until it was burned to the ground by the Burmese army and soldiers from the DKBA in 1996, despite its location on the Thai side of the border. Naw Tauh Tauh said she can still picture the nightmare she experienced when the camp was burned down. “It was in the morning. I was working in my small home-shop. Suddenly, there were mortar shells fired into the camp, and I went quickly from the house to a ditch,” she said. Naw Tauh Tauh said if refugees are to be sent back, the right conditions must be put in place. She said, however, that recent attacks on villagers in Karen state by the Burmese army demonstrate that the time is not right. Kyaw Eh, 20, from Umphiem Mai camp, was born and raised as a refugee. He has spent his entire life in the camp and has no idea of what his parents’ homeland in eastern Burma even looks like. He’s only heard about it from his parents or from news reports about Burmese army attacks on villagers. He said he does not understand how anyone can consider sending refugees back to Burma while tens of thousands of new refugees are crossing into Thailand because of recent conflicts. Kyaw Eh added that he thought voluntary repatriation was not a bad idea, but authorities needed to ensure the safety of the people and to respect the decision of individual refugees. Naw Htoo, 39, is a widow with four children. She has lived in Umphiem Mai camp for three years and is not registered with Thai authorities or the United Nations High Commissioner for Refugees (UNHCR). She said she is worried for the future of her children and herself when she hears talk of “voluntary return”. UNHCR statements on voluntary repatriation echo sentiments expressed by refugees, urging that fighting must cease and refugees must sign papers attesting that they voluntarily wish to return. After statements by the Tak governor were made public, several Karen community organizations met to plan a campaign to raise awareness of the rights of refugees and to research opinion on the voluntary repatriation proposal. Saw Eh Thwe Taw, a CBO worker who attended a meeting about the campaign, said Karen groups agreed that, considering the current instability in eastern Burma, it is not possible to think about repatriation right now. Representatives from the Lawyers Council of Thailand and human rights groups were to hold a press conference this afternoon at the Foreign Correspondents Club of Thailand to “share recent information” and make “recommendations for ‘voluntary repatriation’,” according to a press release announcing the event.